When deciding on a fairytale princess theme for their autumn/winter collection, it can’t have escaped Dolce & Gabbana’s notice that Frozen, the Disney film telling the story of princesses Anna and Elsa, became the most popular children’s film of all time in 2015. Princesses, it seems, are big business. The brand went all-out on the set for Sunday afternoon’s show in Milan. It was apt for the day of the Oscars ceremony, complete with chandeliers, a gold carriage and princess bed, props borrowed from La Scala. The audience walked into an atrium that had a mirror with “who is the fairest of them all?” written on it, and a huge pumpkin practically asking for a cameo on Snapchat. There was all the glitter, shine and silliness of the dressing up box in the collection – sequinned dresses with Snow White collars, metallic cloaks perfect for slipping out to a ball, coats made of flowers to sleep in for 100 years. Dresses were fit for a roll call of Disney-approved princesses: Sleeping Beauty’s Aurora, Cinderella, Snow White and Belle included. One dress had the slogan “dreaming of my prince” written across it in punk-style letters. It has to be hoped that most women’s tastes go beyond the costume department of the Disney store, and that their ambitions in life go beyond snagging a handsome prince. Accordingly, the better designs here played with the idea a bit more. The opening outfit wasn’t very princessy at all. Instead, it was the frocked coat and britches borrowed from the prince. Another model wore a man’s jacket over her bias-cut floral dress, and chunky boots. There were also outfits in case the princess needed to get an office job: a white blouse with embroidery, worn with a pencil skirt, and a simple black dress with a cat in sequins on the skirt. “It’s the princess of today, the new generation,” said Stefano Gabbana backstage before the show. “Every woman wants love, a prince, but the new generation is more independent. Look at Frozen. The biggest love, in the end, is for the sister.” Gabbana said this thinking led to pairing chunky boots with princess dresses, the mannish suiting and oversized jackets with floral dresses. The Cinderella glass slippers and bags with gold Disney-style ornamentation were less easy to justify in a grownup woman’s wardrobe but, perhaps, proved irresistible. 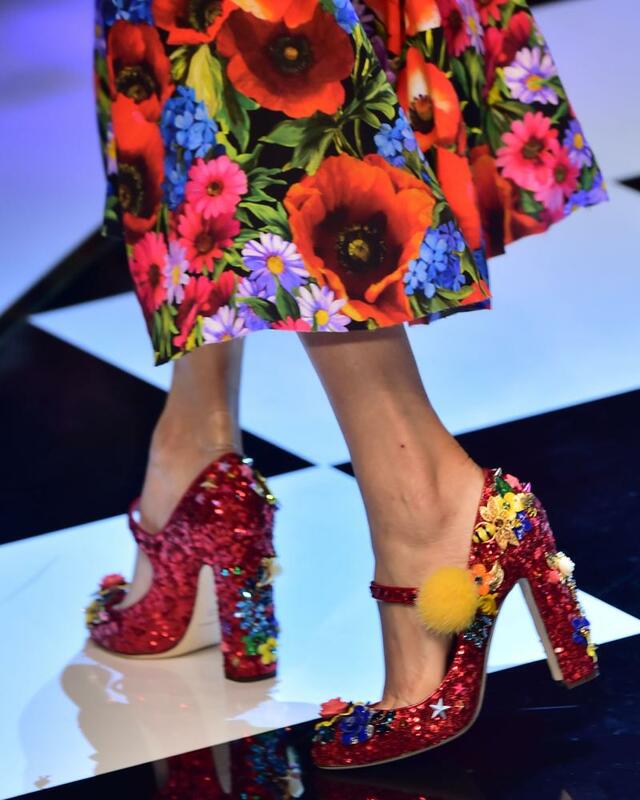 “For us, fashion is fantasy,” said Gabbana. 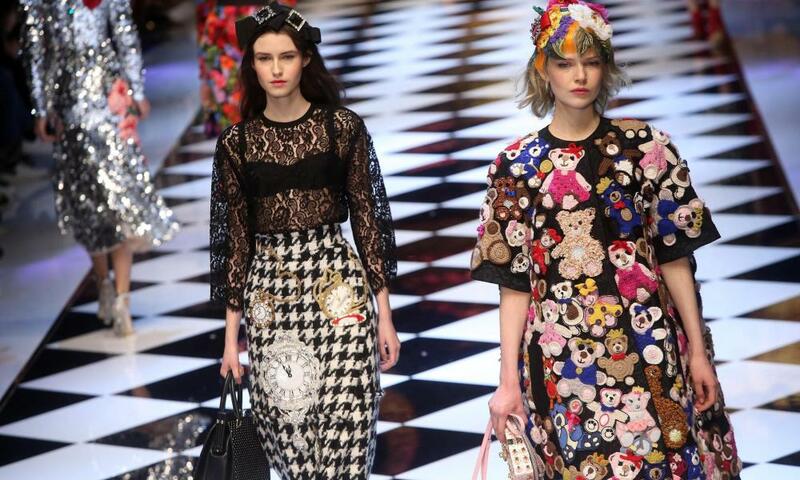 Whatever fantasy is happening on the catwalk, Dolce & Gabbana’s performance in the real world is convincing. Whatever fantasy is happening on the catwalk, Dolce & Gabbana’s performance in the real world is convincing. Figures for the financial year ending 2016 will show that the brand had revenues of £937m, up 13% on the previous year. Since 2012, they have staged Alta Moda, collections of highly detailed bespoke couture designs presented at lavish invite-only events for couture clients in January and July. The increase in revenue is, according to the brand, from this higher end of the market. These customers – some of whom quite possibly could be real life princesses – would no doubt appreciate Sunday’s collection. These customers – some of whom quite possibly could be real-life princesses – would no doubt appreciate Sunday’s collection. Earlier in the day, the Marni show was a different view of Milan fashion week. Designer Consuelo Castiglioni has built up a loyal following for her combination of luxury paraphernalia – fur, embellishment, statement accessories – with a wilfully odd and arty point of view. This collection had all the trademarks – odd hems, fur shrugs, oversized sleeves and a colour palette of greens and browns mixed with vibrant print. A printed shift dress with a band of bright blue oversized sequin paillettes was particularly desirable. With fashion insiders among the Marni devotees, it is sure to be spotted in the front row next season. The shows conclude in Milan on Monday, with Giorgio Armani. Paris fashion week starts on Wednesday, with shows from Martin Margiela and Dries van Noten.